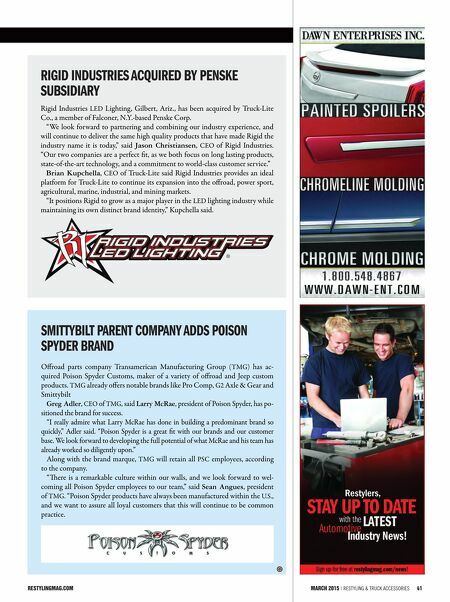 40 Restyling & tRuck AccessoRies | March 2015 restylingmag.com Acquisition by Action cAr And truck Forms cAnAdiAn Powerhouse news Action Car and Truck Accessories, a dis- tributor and retailer of automotive aer- market accessories in Eastern Canada, has acquired CTP Distributors/Custom Truck Parts Inc. of Western Canada. e combined companies now include four major distribution centers (Surrey, Edmonton, Pickering, Moncton), four secondary distribution points (Calgary, Grande Prairie, Winnipeg, St. John's), 37 retail stores with installation facilities, and e-commerce stores catering to wholesale, retail and commercial fleet segments. e merger creates a strategic union that enhances the company's competitive po- sitioning within the wholesale, retail and fleet upfitting sectors in Canada. "Now that we will be combined under one umbrella, CTP and Action will be the only truly national aermarket accessory company that deals in all aspects of the aermarket accessory business in Canada," said Bill Kluyt, CEO of CTP Distributors. "I am very proud of CTP and what we have accomplished in 22 years, but even more proud and excited of what the combined efforts of CTP and Action will bring to the aermarket accessory business in Canada." e merger positions Action Car and Truck Accessories as the largest commer- cial fleet installation network in Canada, a segment of the business with tremendous opportunity and growth potential, accord- ing to the company. 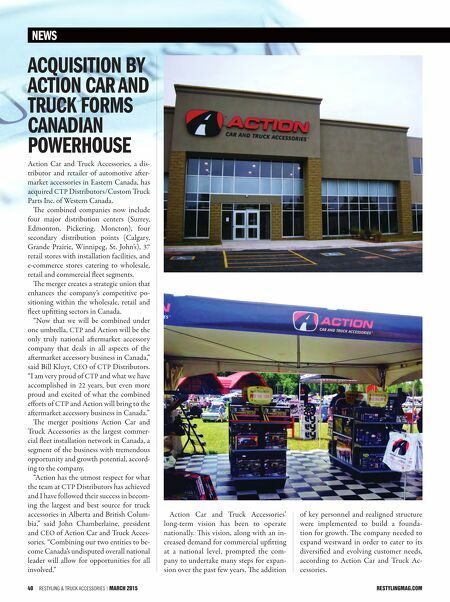 "Action has the utmost respect for what the team at CTP Distributors has achieved and I have followed their success in becom- ing the largest and best source for truck accessories in Alberta and British Colum- bia," said John Chamberlaine, president and CEO of Action Car and Truck Acces- sories. "Combining our two entities to be- come Canada's undisputed overall national leader will allow for opportunities for all involved." Action Car and Truck Accessories' long-term vision has been to operate nationally. is vision, along with an in- creased demand for commercial upfitting at a national level, prompted the com- pany to undertake many steps for expan- sion over the past few years. e addition of key personnel and realigned structure were implemented to build a founda- tion for growth. e company needed to expand westward in order to cater to its diversified and evolving customer needs, according to Action Car and Truck Ac- cessories.